The Beatles 50 Years Ago Today: September 9, 1967. Beatles Radio: The Beatles, Solos, Covers, Birthdays, News The Fab 4 and More! In the early part of September 1967, Paul McCartney invited Norrie Drummond to his Cavendish Avenue home for an exclusive interview. The conversation would be published in the September 9th issue of the New Musical Express, and later reprinted for the United States in the January 1968 issue of Hit Parader magazine. This chat between Drummond and McCartney touches on spiritual matters, and the Beatles' new creative vantage point. At the time of this interview the Beatles are making last minute arrangements to begin filming their made-for-TV movie 'Magical Mystery Tour.' Meanwhile, the 'Sgt. Pepper's Lonely Hearts Club Band' LP is still at the number one spot on the US and British album charts, three solid months following its June release. As most people must have noticed, the Beatles have undergone a major change in the past year. The moptops have gone and been replaced by four highly individual, creative personalities. The 'yeah-yeahs' and the 'ooohs' have given way to sitars and melotrons. The Beatle boots and round-collared jackets have been discarded and been replaced by kaftans and beads. No longer is it news when they are seen at clubs or theatres. At last the screams are fading away. To find out more about the great Beatles' transformation I visited Paul McCartney at his St. John's Wood home recently. I told my taxi-driver the address. "Oh, you mean where that Beatle lives," he said. No more than half a dozen fans were waiting patiently at the massive iron gates of his house. The gates were opened by his housekeeper, Mrs. Mills ("She still hasn't given me a tune yet," says Paul), who led me into the lounge. Paul's huge Old English Sheepdog, Martha, bounded forward, leaped up, put both front paws on my shoulders and started chewing my tie. His three cats -- Jesus, Joseph and Mary -- were crawling over each other underneath the television set. Paul, dressed in a green, floral-patterned shirt and green slacks, sat cross-legged in a large green velvet armchair. Mike McGear, Paul's brother, was just leaving with several kaftans over his arm. A large 'Sgt. Pepper's Lonely Hearts Club Band' poster is pinned to one wall. His book collection includes many works on yoga and meditation. At the moment all four Beatles are on holiday, although they have been recording. "When I used to tell you we didn't know what our plans were, it was simply that we hadn't been told what we were going to be doing. Now we simply just don't know." Mrs. Mills reappeared bearing cups of tea and a large cream sponge. "The only thing lined up for us is the TV show," said Paul, stirring his tea. "But we're still trying to work out the format. We've also been recording the past few nights, and our next album will probably come from the TV show." Anything that the Beatles now indulge in they obviously do for love, not for money. "We can now sit back and pick and choose what we want to do. We're not going to turn out records or films just for the sake of it. We don't want to talk unless we've got something to say." "When you don't have to make a living, a job has a different meaning. Most people have to earn a wage to live. If you don't, you take a job to relieve the boredom, but you do something which gives you pleasure." "We enjoy recording, but we want to go even further. I would like to come up with a completely new form of music, invent new sounds. I want to do something, but I don't really know what." "At the moment I'm thinking things out. There seems to be a pause in my life right now... a time for reassessment." I asked Paul if he ever regarded himself as being rather like a retired man of sixty-five, who was now only pottering around, dabbling in his favorite hobby. To a certain extent he was inclined to agree. "I don't regard myself as having retired, but what do most people do when they retire? As you say, they become wrapped up in a hobby. Either that or they find another job." "I would like to do something else, but what that will be, I don't know." Despite the fact that three of the Beatles are married and they are, all four of them, very different individuals, they still have that same bond of loyalty to each other that they have always had. They are still each others' best friends. If they are asked to do something as a group and any one of them doesn't want to take part, then the scheme is dropped. "If three of us wanted to make a film, for instance, and the fourth didn't think it was a good idea, we'd forget about it, because the fourth person would have a very good reason for not wanting to do it." In the past year Paul has become a much more introspective person. He is constantly striving to discover more about other people. What is depression? Why do people become bored? What is his ultimate goal? These are the questions to which Paul has tried to find the answers in books on meditation and in lectures by men who know more about it than he does. Maharishi Mahesh Yogi is playing a big part in developing the Beatle minds. He is the man who gave them strength when they heard of Brian Epstein's tragic death. "I'm more tolerant now than I was, and I feel more at ease myself, but I'm not less certain about many things," said Paul. "In some ways I envy George, because he now has a great faith. He seems to have found what he's been searching for." "When we went to India we were amazed. So many people, living in terrible poverty... but everyone was so happy. They were always laughing and smiling, even though most of them were starving. For people in the Western world to understand why these people can be so happy is a very difficult thing." With John, George, and Ringo, Paul will be flying to India again shortly to study transcendental meditation with Maharishi. To a certain extent, Paul's music is his greatest emotional outlet. "Ravi Shankar discovered himself through his music, and I suppose in many ways we are, too." This is apparent in their latest albums, which feature many tracks based on personal experiences. But how far can one go with any new art form, be it music, films or theatre? Will the great general public accept it? "We've never set out with the sole intention of trying to please people. It's been wonderful that so many have appreciated what we've done. We don't want to come to a point where we wave 'cheerio' to anyone. We want to take them along with us." 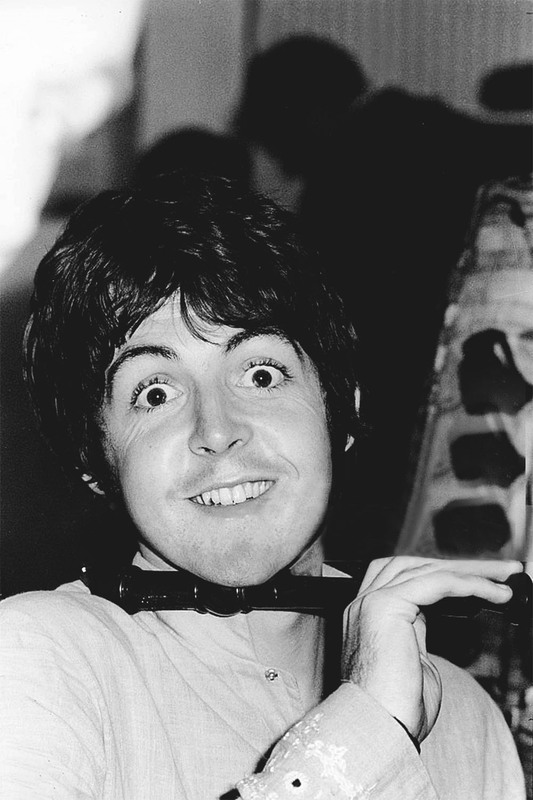 Paul McCartney certainly is more at ease now and much more tolerant and understanding. But he's still searching for something. Whether or not he'll ever find it, I just don't know. But he is determined to, somehow.